Making stuff is fun. Putting bits together, taking them apart again to see how it works, putting them back together in a slightly different way: it's incredibly satisfying. This is why we decided to devote eight pages to building your own distro. Three different methods, infinite possibilities. The only limit is the number of rainy days you'll have to do it all (let's face it: we have plenty of rainy days to play with). 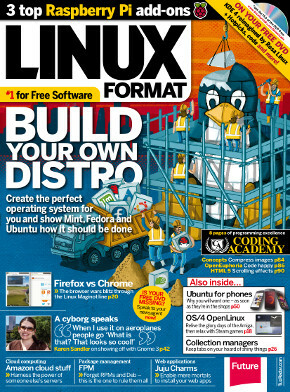 Also in the issue: hear from the Gnome Foundation's executive director, and come away buzzing with fresh enthusiasm for free software. If you're into buzzwords – or deploying web apps to the cloud easily – you'll appreciate Mr Nick Veitch's tutorial on Juju Charms. And if you like talking to other human beings you'll want to know all about the Ubuntu for Phones OS, which looks to us like a real winner. or at least, it will be, if Canonical can get it to market before Sailfish. All this, plus coding, reviews and more, only in Linux Format! On the DVD: Rosa Linux, Perppermint, Sonar and FourM. Plus hotpicks, code books and more.